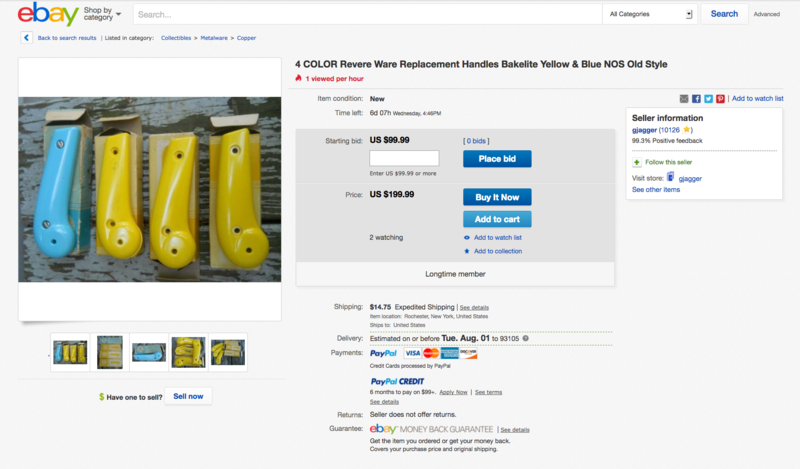 I am not sure why (I prefer black), but people seem to be willing to pay a lot for colored vintage Revere Ware Bakelite parts. Here is a large batch of colored handles for your viewing pleasure. That listing went for 110$ for 4 colored handles! Honestly my jaw dropped when i saw them, perhaps you should manufacture and sell colored handles also? I would never pay +25$ per handle thought. There aren’t any available else where either to my knowledge. I don’t think these were anything other than a niche item in the day, so I suspect demand would be pretty slack if we were to manufacture them now.